It has been said that the seeds were chewed by early Americans to suppress appetite during church services. Just like Fennel seeds, Dill Seed oil is a regulating food cravings. Dill Seeds are sometimes baked into savory breads in Germany and Scandinavia, for great bursts of flavor. The name 'dill' may come from the Norwegian word dill (to lull). It is a member of the Umbelliferae (parsley) family. Growing to about one metre high with inflorescence of yellow flowers which is generally appearing in the summer. Basically its an annual aromatic herb. The oil has a powerful and fresh, sweet spicy, peppery and aromatic odor. Chemical constituents: Dill seed oil has various chemical compounds that include carvone, dillapiole, limonene, and dihydrocarvone. 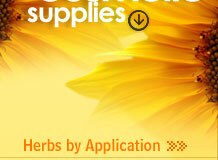 The herb oil contains, less carvonethan the seed oil. It contains mainly d-a-phellandrene, eugenol, thymol, isoeugenol, linalyl acetate and phellandral. Aromatherapists credit dill Seed with being an effective stimulating, revitalizing, restoring, purifying, balancing, antispasmodic, carminative, diuretic, stimulant, stomachic and cleansing agent.t has also been used as a remedy for colic and insomnia and as a stimulant for lactation. The oil is used extensively in beverage and foodstuffs. Dill seeds are used whole or ground as a condiment for flavoring meats, sauces, stews, breads, vinegars, pastries and vegetables. Dried and fresh leaves are used in sauces, salads, soups, stews and vinegars. Dill seed is one of the most flavored herbs for Iranians and in recent years the herb and its seeds have found applications as natural reducing agent of blood glycerides. In Europe, specially in Germany, dill oil gives pleasant aroma and flavor to any dish. Uses in food : Different soup, sauce, salads, pickles, vinegars, fish and rice. It is also used in confectionary, cakes, bread and apple pie. Dill is used mainly in the food industry as an herb or extracted oil for flavouring pickles and various other foods. Dill oil is almost exclusively used for flavouring purposes in pickle industry due to high concentration of a chemical called carvone. Of course, dill is best known as a pickling herb for cucumbers, and also green beans, carrots, and beets. Dill seeds add zest to breads, cheeses and salad dressings. Dill adds an ornamental element wherever it grows. It can be combined with flowers in a bed or border. Its fern like foliage provides a soft background for smaller sun-loving petunias, daisies, marigolds and others. It is also planted with other herbs near the kitchen or in containers such as windowboxes or planters so its fine texture contrasts with the coarser foliage of basil, mints and others. Its yellow umbrella-like flowers make great cut flowers. In the garden they attract beneficial insects, including bees, parasitic wasps, and tachinid flies. In orchards, it attracts insects that control codling moths and tent caterpillars. 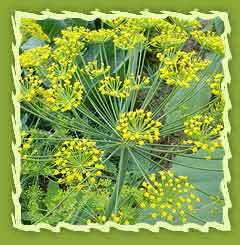 Wherever dill blooms it contributes to the welfare of neighboring plants. Some dill oil is used in cosmetics and perfumes. Myristicin, apiol, and dillapiol present in dill oil are effective naturally occurring insecticides. It is also an important fragrance component in detergents, soaps and shaving lotions. Dill is also used in making diffusers, candles and vaporisers.